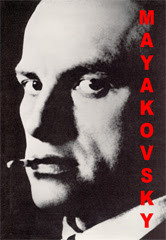 The film Meyerhold, Theatre and the Russian Avant-garde, grew out of the Mayakovsky film. Meyerhold's task was to combine the three dimensionality of the actors body with the flat two dimensionality of the set design. In order to solve this problem he turned to the developments in the graphic experiments of the Russian avant-garde, people like Popova, Rodchenko etc. He also wanted to move away from a theatre based on words or text for expressing emotions and ideas, to a theatre based on gesture and movement in order to create and widen the possibilities for creating an emotional atmosphere in any given play. For instance Chekov wrote(roughly speaking) for one type of theatre which was actor/text based. Meyerhold's productions included influences from Kabuki theatre which is based on mime and dance, the action developing around a series of gestures and poses as much as a result of the text of the play. 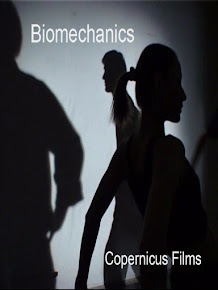 With both of the above in mind, Meyerhold developed a specific training technique for his actors called biomechanics. It consisted of a series of exercises and movements in which an actor could collectively, either with a partner or a group of actors, develop non textual or non verbal ways of expressing inner emotions. Through the movement of the actors body, emotions which could not easily be represented by words i.e. crowd scenes or group or mass action revealed themselves on the stage. One of the first plays in which all these elements were synthesised was "The Magnanimous Cuckold". 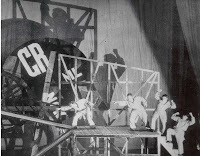 Popova designed the set as a moving dynamic construction almost like a machine in motion. The actors deprived of any make up or costumes struggled to find their feet in this unusual set construction. 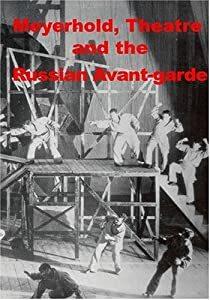 Here however Meyerhold's training of biomechanics helped and both actors and set were synthesised into one grand machine moving in unison to the rhythm of Meyerhold's direction. In order to show how Meyerhold achieved this in a documentary film it was decided to use actors to "recreate" Meyerhold's techniques. 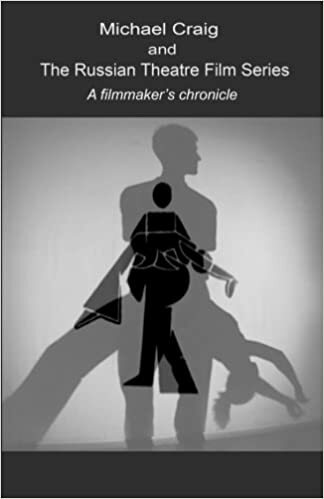 A simple solution was devised of filming the actors performances as shadows. We shot the shadows with an English actor in Moscow who had previously studied at the Moscow Arts theatre. We weren't quite sure how to go about filming biomechanics so we improvised using the knowledge that we had. The idea of the shadows was to make the presentation more abstract and less concrete so that the emphasis would be on the movement itself rather than the person. This, as far as I understand was echoing some of Meyerhold's ideas. Once again I asked Slava Sachkov to film the sequences of shadows. Watch an extract from the film. After a long and torturous route this film has finally been completed and released on Amazon as DVD. It is the sixth film in a series about the Russian avant-garde by Copernicus Films and the director Michael Craig. The film took longer than expected for many reasons. Firstly it was necessary to interrupt the editing to finish the film David Burliuk and the Japanese Avant-garde(Also part of the series). secondly when it came to editing the material it was obvious that there would be a need to shoot more material. Also in a strange sense I wasn't sure how the film should look or be. After making four films about the Russian avant-garde where the style was relatively similar, now I was confronted with a set of material and a subject which required a different approach and a different look but at the same time should integrate with the over all series. 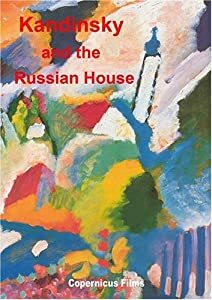 For this reason I embarked on finishing David Burliuk and the Japanese Avant-garde and leaving the editing of Kandinsky until later. As it turned out this was a good idea. When I returned to the Kandinsky film I had fresh ideas which were incorporated into the film. One of the central ideas of the film was a sequence where Kandinsky enters his studio and is struck by the sight of one of his paintings bathed in rays of light. He doesn't know whether the painting is upside down or what the painting is supposed to depict. It was at this moment that Kandinsky took a leap forward in his search for abstract forms in art. In the editing of this sequence all the threads and various elements of the film came together. The idea was to show the state of Kandinsky's consciousness at the particular moment of illumination and to illustrate the accompanying transformation in his consciousness. How Kandinsky's understanding of his own art transformed itself qualitatively to a new level. From here the film became much easier to edit and eventually complete. 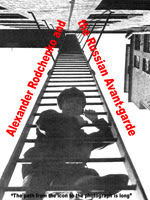 About the photography of Alexander Rodchenko and the making of this film in Moscow. When I began to make films in Russia in the mid 1990s, I was prepared for all kinds of problems but none of the problems I subsequently encountered. I had already worked in the UK for many years in the film and television industry. I finally decided to move to Moscow to make films and to write. The first two years was a question of finding my feet both linguistically and culturally in a city and a society which was undergoing a total transformation. I had an advantage in that I had already learnt Russian language at school and also had worked in St Petersburg for almost four months on a BBC Drama in 1993. It was this experience which decided me to move to Russia, albeit Moscow. All the same there is a great difference between working in Russia with all the support that a paid position offers and actually living day by day in an alien environment. As I already mentioned the first two years were a case of acclimatization. Just as I ran out of money during my first winter in Moscow in a tiny room in a large apartment built in the Stalin era, I was offered a job on a feature film "The Saint". This got me through the worst deprivations of that first year. It wasn't so bad in reality. The apartment was warm and the old lady who owned it, let me live my life as I pleased without interfering. As long as I paid the rent, that's all she worried about.The job on the "Saint" ended and a BBC film "The Stringer" started shortly afterwards in Moscow and I worked on this film for the next six months and by the time the following winter arrived I was in a better financial position than the previous winter. I had also got into the Moscow rhythm of life so that even the financial collapse of 1998 passed me by more or less unnoticed as it did many Russians who considered it just another one of those things which they had to cope with.However I felt it was time to start on my own work and make a film. That was one of the main reasons I came to Moscow. When I was working in Warsaw I was introduced to Zygmunt Malanowicz, who played the role of "the young man" in Roman Polanski's first film "Knife in the Water". I asked him why he didn't go to Hollywood with Polanski when he had the opportunity. He wasn't able to give me a good answer but he said he was much happier making feature films in Minsk for under $70,000 than spending his time in Hollywood. It was one of those moments which opened my eyes to a whole new set of possibilities for making films outside the usual political system for raising money for film projects. Also the aesthetic of Eastern European and Russian Film making appealed to many of my sensibilities. So now I was in Moscow with all kinds of ideas for making films but where to start. 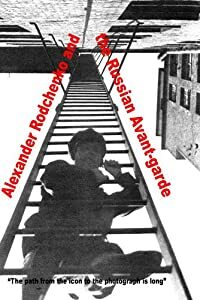 I became interested in the Russian avant-garde of the 1920s and 30s and by chance picked up a book in the Tretiykov Gallery about the avant-garde artist and photographer Alexander Rodchenko. What attracted me to him especially was that he gave up painting for photography, denouncing paining as "finished" and unfit to express the modern social and visual realities of life in the early 19th century with its speed and industrial cityscape's and mass culture. Photography he believed could better express and embody this reality and Rodchenko set about experimenting with new techniques of photography and photo collage, exploring new visual territory in his home in Moscow. What especially interested me about Rodchenko was that he denied the value of painting and art as a matter of principle and this I thought would be a good starting point for a film.I decided there and then to make a film about Rodchenko and his work. I gathered together some money and began researching Rodchenko's work and managed to find a good camera operator, Valentin Savenkov. I wrote a script showed it to Valentin and worked out where and what in Moscow I wanted to film. This was relatively straight forward at that time.The first day of filming around Moscow was not good. After about an hour it began to rain and didn't stop for four hours. I had checked the weather forecast but light drizzle was all that was expected. A week later we tried again. It was mid october and the weather was perfect. A deep blue sky, such as you only get in Russia at that time of the year when the air is cold, crisp and clear. Perfect weather for the kind of effect that I wished to bring to the film. Sharply defined edges of light and shade to give volume to the composition of shots and which would compliment Rodchenko's photographs. One of the hallmarks of Rodchenko's work is the balance between light and shade, volume and line all of which are contained within the composition of the photograph and its subject. Nothing needs to be added or taken away afterworlds, no effect or mystification is necessary everything exists already in the photograph and its compositional value giving a visual power and strength which is immediately apparent.The real problem came when I decided that I wanted to film a dramatisation of Rodchenko using an actor. I had a venue where I could film - a small room in a Museum which had a desk exactly like one in a photograph with Rodchenko working in his study. It just needed a bit of rearranging and we were back in the 1920s. The hard bit was finding Rodchenko. Rodchenko had a shaved head which gave him a very distinctive look. It would have been possible to find any bald actor and film them in shadow or partly hidden so that the face was not important but just the over all impression. I interviewed actor after actor but it just wasn't right. I was introduced to a famous Punk singer, Sasha Sclyr, who had also shaved his head. I met him but again it just wasn't right. I began to get desperate. I found an American who seemed to fit the part but he disappeared almost as quickly as he appeared. I started to look for bald men on the streets of Moscow, on the Metro trying to gather enough courage to ask them if they would be interested in working on a film. The few attempts I made were not very successful. I began to contemplate using Yuri Lushkov, the bald Mayor of Moscow and drafted a letter which with the help of an influential friend I could maybe enlist him in the part of Rodchenko. I wanted to get on with the film and I was getting nowhere.I had given up, nothing was working. Then one evening I was in a cafe in the Tchaikovsky Concert Hall waiting to meet someone and I saw that in an enjoining cafe they were filming something. Always interested, I walked round to get a better look. One of the actors that I worked with on the "Saint" was playing one of the roles in the main scene they were filming in the cafe. Suddenly a guy with a shaved head walked onto the set from behind the camera said something to the actors and walked back into the shadows from where he had appeared. My first thought was "its Rodchenko". The resemblance was uncanny, not just that he had shaved his head but everything. In a free moment I caught the eye of the actor that I knew and asked him who is that guy. "He's the director". "Introduce me to him". I said. I had to wait to the filming stopped and I was introduced to Anatoly Artemanov, the director of the film. Anatoly was a Russian Director living in new York and he had come over to Direct Russian in Moscow quickly explained to him what I needed him for and he immediately agreed and when I told him I had some money and that I could pay him he said "and you'll pay me as well !- that's even better".This was the final piece in the jigsaw of the first film I made in Moscow and the film was completed with final editing and sound recording in March 1999. I found an English actor William Rousey, to do the narration. In this I was very lucky. 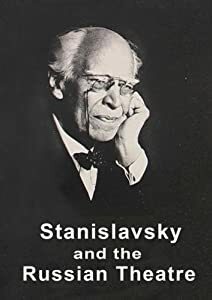 He had studied at the famous Moscow Arts Theatre and so had a good grasp of Russian culture and the kind of voice that I thought would suit the film. I hadn't intended to make any more films about the Russian avant-garde but as always one thing leads to another. The Rodchenko film was quite successful and the outline of a second film began to emerge about avant-garde architecture of the same period. This again would pose problems but of a very different kind. Features of the Russian avant-garde. 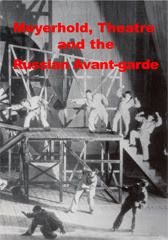 Features of the Russian avant-garde. One of the important things to remember about Rodchenko and his co artists was that they sought to de-mystify art, to reveal its most fundamental character, its reality, exposing its materials and processes. And they attempted to engage the viewer in a direct and unmediated experience. There was no attempt to represent an outside reality or a reality which was doctored in the developing process, with the viewer responding only to what was in front of them. As a communist his idea of photographic truth would have satisfied many of Rodchenko's ideological and concerns as well as his "aesthetic" quest for truth.Rodchenko used qualities already inherent in the subject - light,shade, volume. line, contrast etc and drew the viewers attention to these qualities by his system of Rakursy or perspectives i.e. using the angle from which the object is photographed to maximize the compositional value of the subject or the visual dynamics of the subject without falsifying it. In other words these qualities are already inherent in the subject and the camera is used merely to bring out these qualities in new and interesting ways - to make the usual unusual and and make the unusual usual. Rodchenko was against manipulating the technical capacities both in photography and and developing stages by interfering unduly in the process to produce effects, which would distort the reality of the subject. "Rakursy" exploited the visual "laws" already given in the everyday world as seen by human beings. The function of the camera is to exploit these laws, volume, light shade, rhythm etc) to the maximum advantage for presenting the subject to the viewer. Not arbitrarily as Rodchenko was often accused of doing but consciously and deliberately. As Rodchenko himself noted. "These laws have always existed even though they are hard to describe and explain. For instance there is one picture of a diver on an ascending upswing before descending into the water. The diver is placed in the far right hand corner and the question arises why not in the center or in the left hand corner or to the side. Rodchenko consciously exploits two of the specific features of human perception. In western culture we read from left to right. The placing of the figure in the top right hand corner creates a natural dynamic drawing our vision upwards to the rising figure. We seem to be looking up as if we were at the event itself staring up as a spectator even though we are looking at the photograph square on. Secondly the illusion of motion is purposely created from a still image, which at that time was an innovative and bold approach to photography which today we very much take for granted . Its not clear if they are connected but Rodchenko's sketch on a note pad on the left hand side seems to show how important these geometric "laws" were for Rodchenko' approach to photography. New Films in Series "The Russian Avant-garde"
In addition to the four films already released about the Russian Avant-garde of the 1920s and 30s, Copernicus Films is releasing two further films in the series "The Russian Avant-garde" which are now in post production. "David Burliuk and the Japanese Avant-garde" will be ready for release on DVD in a month. 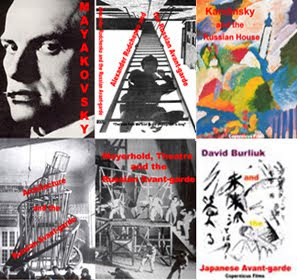 The film charts the work of the Russian futurist David Burliuk in Japan. After he left Russia during the Russian civil war, David Burliuk spent two years in Japan and put on exhibitions in Tokyo, Kyoto and Yokohama. His influence on the growing Japanese futurist movement was immeasurable where he worked with Japanese artists such as Kinoshita and Muramaya. The film features locations in Moscow, Tokyo, Kyoto and a small Island on the Pacific Ocean which Burliuk visited in the manner of Gauguin. Japanese art was was gradually transformed in the Meiji period of the late 19th century and early 20th century after the Meiji restoration which heralded Japan's entry onto the global stage. 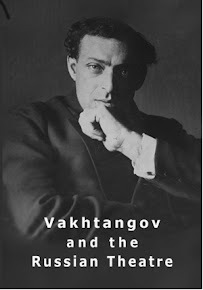 The other film to be released in the series is a film about Kandinsky. This will follow towards the end of spring 2007. Watching many films which use slow motion for effect gives rise to the question of time in film making. Tarkovsky seemed to be able to create time in his films, to slowdown time, speed up time and play with the concept of time in general exploring its dimensions character through the lens of the camera and its relationship to the speed of the film. Tarkovsky does use slow motion in his films but even then it is not noticeable as an effect or something which is artificially induced in the process of editing. One example of this characteristic is particularly evident in the film Andrie Rublev. In the scene after the taking of Vladimir there is a lull in the action. A group of soldiers are battering down the door of the cathedral where the local population have taken refuge. The sound of the ramming is a set beat repeated over and over again. The two princes, Russian and Tartar are patiently waiting almost unconcerned with the proceedings sitting on their horses who also seem to be waiting patiently, resting so to speak. The repose of the riders and the horses contrasts with the rhythmic beat of the battering ram. The whole effect creates a sensation of two strands of time operating simultaneously. When the doors of the cathedral are finally breached, the two princes and soldiers burst through the open doors and the two time strands are united with their combined action, that is the entrance into the cathedral. This episode marks the beginning of a kind of fall of civilisation and is followed, historically, by a period of desolation in Russia and to some extent, if I remember rightly it marks a period of desolation in Andrie Rublev's artistic and spiritual state, which for Russian icon painters are one and the same thing. The spiritual and the artistic are combined in the activity of painting icons. This period of desolation ends in Russia and in the film and for Andrei Rublev, with the final scene of the tolling of a huge bell which has been cast by a young boy whose father, the master bell maker was killed in the preceding upheaval. The scene is fraught with tension as there is no guarantee that the bell will ring true as the secret of casting the bell may have been lost with the death of the boy's father. Two of the workers start to swing the hammer which creaks with the rhythmic swinging creating a beat which seems to echo (in my mind) the rhythm of the pounding of the cathedral doors which I just mentioned above. As the hammer approaches closer to the side of the bell, the tension and anticipation increases until suddenly we are released and from this state with the relief and joy of the first deep peal of the bell which resonates around the waiting crowds. Its supposed to be, I believe, for Tarkovsky a moment of renewal and transformation in the film. Once again two strands of time which are identified in the rhythm of the battering ram and the rhythm of the bell being tolled are organically unified in the overall structure of the film. The moment of the first sound of the bell is similar to the moment when the doors of the cathedral are breached. The circle has been closed and there is a spiritual restoration with the pealing of the bell. The rhythm of the battering ram and the scene with the bell and the consequent transformation of the scene to a new rhythmic and visual structure are mirrored in each other which unifies the opposition of their content. The bell scene is almost identical to a scene in Ridley Scott's film about Christopher Columbus. He uses the scene to mark I presume the establishment of civilisation in the New World, However it appears to be added into the film seemingly with little or no purpose other than a good scene. The fact that the church is destroyed later in a storm adds little to the significance of the scenes inclusion in the film. Incidentally the writer of Andrei Rublev, Director Andrie Konchalovsky, appeared on a Russian TV programme and was quite critical of Ridley Scott albeit in a different context. I wonder if the two are connected and if Konchalovsky had the bell ringing scene in the back of his mind when he made his comments. Copernicus Films operates out of Russia making documetary films and was created by Michael Craig. 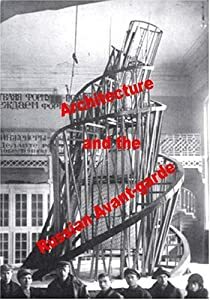 At the moment we are completing a series of films about the Russian Avant-garde of the 1920s and 30s including films about Mayakovsky, Alexander Rodchenko, Meyerhold and Russian Avant-garde architecture as well as other figures of the Russian Avant-garde. All films are out on DVD and can be purchased on Amazon. The series will eventually be made up of six films possibly more. All films have been shot on location in Moscow over a period of several years. Maykovsky was shown on Swedish TV in 2006, Alexander Rodchenko and the Russian avant-garde was shown on the ArtsWorld channel in the UK in 2003 and premiered at the Milan International Film Festival. I live and work on a permanent basis in Russia. The details of this I will go into in later entries. There are many reasons to work in a different country but as far as Russia is concerned if you want to make films, the creative atmosphere in Moscow combined with the history of film making in Russia, makes this as good a place as any to work. Many people may doubt this but after nearly twelve years in Moscow I can say otherwise.